The typical career path isn’t a nice, well-lit, straight, flat street. It’s more like Lombard Street in San Francisco — in the dark. 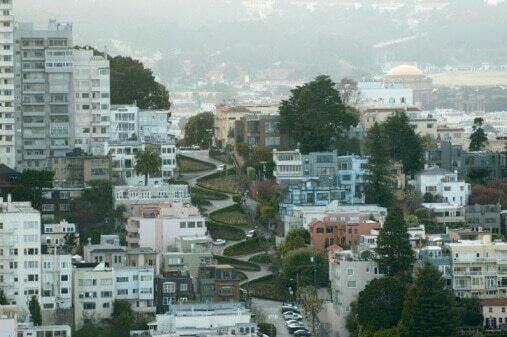 Lombard Street is best known for the one-way section between Hyde and Leavenworth. Here the road has eight sharp turns (or switchbacks) that have earned the street the distinction of being the most crooked in the world. The switchback’s design, first suggested by property owner Carl Henry and instituted in 1922, was born out of necessity to reduce the hill’s natural 27 percent grade, which was too steep for most vehicles. Much like Lombard Street, the road ahead for accounting students is steep and winding, with lots of switchbacks. But all of those turns help you get where you are going — safely. A couple of things happen along the career path: You make valuable contacts (even if they don’t seem that valuable at the time), you learn new skills, and perhaps most importantly, you learn more about yourself. We’ve all heard it: It’s not what you know but who you know that leads to success in the business world. While I don’t think that is entirely true (we need essential technical and leadership skills), it certainly helps. You should begin to build that network of contacts now. In this world of hyper connectivity, you have access to leaders at your fingertips through social media. Are you using social media to build your personal brand and business network or to follow the Kardashians? Take advantage of the tools available to you, the ones you are probably already using, to learn and connect with thought leaders. A few I suggest: Tom Hood, Bill Sheridan, Accounting Today, AccountingWEB, Rick Telberg, MACPA … and me, of course! You learn a lot through years of school, but the learning doesn’t stop at graduation. You really never finish learning, especially in the ever-changing and complex field of accounting. But if you read my previous post, you know that a lot of this learning is on-the-job training. These learned skills propel you forward, safely, gradually building on one another, down the winding road. The most important and influential lessons you will learn during your career path are about you. If you read my story, you know that I learned something about myself, three years into my public accounting career, which drastically altered my path. The quiz I took in training that day wasn’t the only assessment I used. After learning that my strengths might be different than my peers, I invested in Strength Finders 2.0 and the VIA Survey of Character Strengths from the Positive Psychology Center at the University of Pennsylvania. Both of these metrics helped me understand more about myself and the type of career and life I was really suited for. I highly encourage you, whether you’re just starting out or a veteran in the workplace, to take these quizzes. If you are preparing for the workplace, understanding your strengths can not only direct your job search but help you land the job. Bring the survey results with your resume; use them as talking points as to why you are a good fit in the organization. If you’re a workplace veteran, use the survey results to reassess what you’re doing. Whether it validates your career or causes you to question your role, it’s a great exercise in being your best self in and outside of the workplace. If you’re interested in learning your strengths to help you lead, attend the MACPA’s Leadership Academy. Here you will learn to identify and leverage your own unique leadership strengths, discover what these strengths mean, and understand the implications of how they affect your personal life, career, and the CPA profession. As students we try to envision our ideal future and do everything we can to make it a reality. We pick a certain school, to get a certain degree, to land a certain job, all to make a certain amount of money and fulfill our “dream.” But I would guess that a pretty small percentage of people are doing exactly what they envisioned they would be when they graduated. A number of factors contribute to this and they aren’t all bad. Ultimately though, the path, often crooked, equips us to reach our destination whether it was where we intended to go in the beginning or not. Leave me questions / comments below or connect with me. I would love to be part of your network!